Launch Day! - You CAN Go the Distance! This book has been a long time in the making. 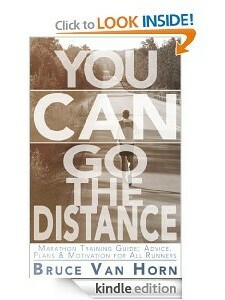 It started off as a series of blog posts I wrote while training for the 2012 Richmond Marathon. Many readers started commenting and asking questions and it just grew from there! Along the way, I started sharing some of my training ideas and motivational tips in 140-character phrases on Twitter and the response to those really surprised me. People started replying and ReTweeting my tweets at rate I never could have predicted. It was humbling to know so many people were interested in what I had to say on the subject! So, after many miles run, many chapters written, rewritten, and edited, the book gradually came together to what it is today! And, again, I am completely amazed and humbled by the response! I am also excited about this website and the online community that will be created around the book’s central theme of “going the distance.” I will be here to interact with you, answer your questions, and to cheer for you as you post the results of your achievements! So here we go! Are you ready? Let’s go the distance together!! P.S. Don’t forget to follow us on Twitter and Facebook! The links are in the upper right-hand corner of the site! 2 Responses to Launch Day! Bruce. You didn’t tell me that you were writing a book. Great job! I have been needing more motivation to continue toward a marathon. Thanks! God bless. Thank you, Kevin. It’s been an exciting project. I’m humbled by how well it has been received!